The Lil Sister to the Beach Bag! Perfect size to use for almost anything! 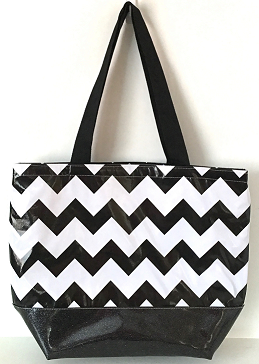 Same size as the Large Tote, only with a sparkly GLITTER Vinyl Bottom! This bag features 3 interior pockets with 1.5" wide black webbing handles that are 27" long and a GLITTER VINYL bottom! Looks perfect with the XL Embroidery option!